Dr. Konstantinos Farsalinos does a huge amount for the vaping community. He’s a prolific researcher and he spends a lot of time refuting anti-vaping junk science. the use of flawed studies to convince people vaping is dangerous. And similar stories are unfolding around the world. There are concerns about the potential risks of e-cigarettes. But most of the time, the things we hear about potential risks of vaping depend on the “cherry-picking” of poor-quality studies. The problem is that this works. When confronted with the findings of a scientific study, clicking the link and trying to check the evidence for yourself is a lot of work. It’s easier to just take the results at face value, but they often aren’t justified. So, which severely flawed studies are most often cherry-picked by the opponents of vaping? Which pieces of research should those against vaping simply stop citing? Here are 18 of the worst offenders. This study looked for formaldehyde-releasing agents (called formaldehyde hemiacetyls) in e-cigarettes vapour. The devices were tested at both a low and a high voltage. At low voltage, formaldehyde hemiacetyls were not detected, but at high voltages they were. Based on the high voltage results, the authors calculated that the risk of cancer from vaping could be 5 to 15 times higher than from cigarettes. The core problem with this study is that the combination of voltage setting and atomizer used would invariably lead to “dry puffs.” These taste extremely unpleasant and don’t represent real-world use of e-cigarettes. This point has been confirmed by later research. At the usable setting, the chemicals were not even detected. It’s like turning a toaster up to the maximum setting, measuring the carcinogens on the surface of the charred bread that pops out and then concluding that eating toast is a significant risk for cancer. The big problem is that nobody eats cremated toast. This study investigated whether trying e-cigarettes is linked to starting to smoke. Researchers used a group of over 2,500 never-smoking 14-year olds to find out. Students who’d tried vaping were more likely to have smoked six or twelve months later, in comparison to those who’d never vaped. So the research doesn’t show that teens become addicted to nicotine through vaping and then progress to regular smoking. It just shows that teens who experiment with nicotine in one form are more likely to try it in another form, too. The authors even note that the study can’t determine that e-cigarettes caused the smoking. Although they tried to control for them, there are inherent differences between non-smokers who try vaping and ones who don’t. These “confounding” variables are likely to be responsible for the results. Dr. Konstatinos Farsalinos points out that the amount of nicotine used in the study was far higher than that found in the blood of smokers. This study involved exposing mice to e-cigarette vapour for two weeks. Researchers looked at the “free radical” damage to the lungs and their ability to clear infections. The mice exposed to e-cig vapour took longer to get better from pneumonia or the flu than the mice only exposed to air. Some of them even died. This was used to claim that e-cigarettes lead to an increased risk of viral infections. Firstly, mice are not humans . You can’t just take a result from mice and treat it as though it translates to humans perfectly. Secondly, the effects of vaping weren’t compared with smoking. At worst this would show that vaping isn’t completely safe. Thirdly, nicotine is already well-known to suppress the immune system in mice and rats. And finally, mice are more sensitive to nicotine than humans. The immune system problems and death in the mice exposed to vapour were probably due to stress and nicotine poisoning. This study looked at past vaping among people phoning a quit-smoking helpline. They aimed to work out whether vaping affects smokers’ ability to successfully quit smoking. Smokers who’d used e-cigarettes before were less likely to have quit smoking by the end of the study than those who’d never vaped. This study has been used to argue that e-cigs actually reduce your chance of quitting smoking. The biggest problem is the way the sample was selected. If you try vaping but then phone a quit-smoking helpline, it means that you were already unable to quit smoking by vaping. 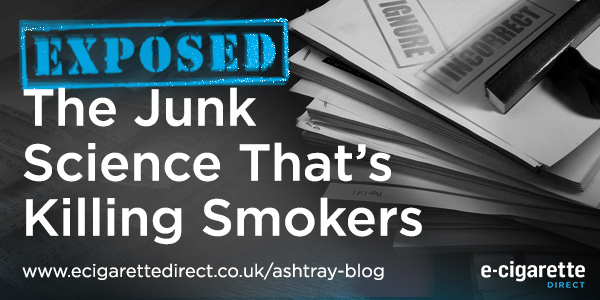 By focusing only on these smokers, the result was pretty much guaranteed. These people are likely the smokers who struggle the most to quit, and the ones who e-cigs just might not work for. Also, 28 percent of the “e-cig group” didn’t even vape for the studied quit attempt. The group was only defined based on what they’d done in the past. This study looked for the presence of various types of chemicals in the air after vaping. They tested three e-liquids using volunteer vapers in a cafe-sized room. The results showed PG, VG and nicotine were released from vaping, as you would expect. They also found a 20 percent increase in polycyclic aromatic hydrocarbons and over twice as much aluminium in the air after vaping. This has been picked up in the media with claims that vaping negatively impacts indoor air quality. “Clean” air isn’t so clean. That’s why taking background readings is important. Otherwise you might mistake normal components of air for something being emitted. The authors took a background reading, but did so on a different day to the testing. This is a big problem – as noted by Dr. Farsalinos in a letter to the editor about the study – because the levels of chemicals can vary from day-to-day. This led to many strange results. For example, they found lower quantities of most metals during vaping, even though we know e-cigs give off small amounts of metal. Also, no other second-hand vaping study has found PAHs. The baseline reading issue could explain this anomalous result. This study looked at the associations between vaping and smoking in American teens. Researchers used data from the 2011 and 2012 National Youth Tobacco Surveys. The results just show that vapers are more likely to be smokers and smokers who’d vaped were less likely to have quit in the last year. The study tells us one thing: the people who vape are more likely to be smokers. That’s it. To confidently conclude that the vaping caused the smoking is pretty much absurd. Carl V. Phillips drives home how critical this problems with the study are. He points out that all the findings would also be consistent with the perfect scenario: that every single vaper is using e-cigs to quit smoking. If they’d asked which came first, it could have given a little bit of a sign of what was actually going on. But they didn’t. There were much lower levels of particulate matter in the vaper’s home than in the smoker’s home. However, it was slightly higher than in the non-smokers’ homes. Based on this, they concluded that e-cigs emit toxicants, including fine particles. The results themselves show the big problem with using this study to claim e-cigarettes aren’t safe for bystanders. The vaper’s home was almost indistinguishable from the non-smokers’ homes. The difference per cubic metre between the non-smokers’ and the vaper’s home was less than one millionth of a gram. In the smoker’s home, levels were 60 times higher. The report involved tests of 47 cigalike e-cigarettes and 50 refillable models. Researchers were looking for acetaldehyde and formaldehyde. They found that 50 products exceeded California’s Prop 65 limits for these chemicals. They also reported the most extreme values they found: 473 times over the limit for formaldehyde and 254 times over it for acetaldehyde. There is no information about what they actually did. The report only says it was tested under “realistic” conditions. It doesn’t even give hard numbers for how much formaldehyde and acetaldehyde they found. The authors even mention the danger in these tests (like in the first study in this article). Yet they still don’t think we need more information to work out if they made the same crucial mistake. “We tested some e-cigarettes in a way we’re not telling you and they’re bad for you” is the short version. That’s why citing this ‘study’ is a complete waste of time. This study simply involved looking for metals and silicate particles in e-cig vapor. Many of the elements identified in EC aerosol are known to cause respiratory distress and disease. They also included a detailed list of the health problems these metals have been linked to. It’s ideal ammunition for those looking to bad-mouth e-cigs. The list of health problems linked to the metals implies that the e-cigarette vapour had risky levels of these chemicals present. In fact, the levels were so small that they’re extremely unlikely to pose a risk to vapers. Unsurprisingly, this information is rarely included when people cite the study. This study surveyed over 16,000 teenagers from the north west of England. Researchers were looking at the links between vaping, smoking and drinking. This last association was spelled out in gory detail. Binge drinking, drinking to get drunk, alcohol-related violence, drinking spirits and buying alcohol from shops were all linked with accessing e-cigarettes. The authors said the findings suggest e-cigs are used for experimentation, not quitting smoking. Although not mentioned in the paper, it was soon used to support gateway claims. This study didn’t actually find out that the teens were vaping regularly. All they found out is whether they had ever tried or bought one, which is mainly measuring experimentation. This puts the other findings into context. These teens are experimenters, so all the shocking associations are totally expected. The results in no way justify the conclusion. As for the “gateway,” it shares issues with the other gateway studies. They don’t know whether the vaping or smoking came first, and regular vaping wasn’t even established. In blunt terms: there is no evidence at all for a gateway effect in the study. The FDA analyzed the contents of 18 e-cigs from two different brands. They were looking for carcinogens called nitrosamines and other contaminants. There were low levels of nitrosamines in five of these products. One of them also contained 1 percent diethylene glycol – an ingredient in antifreeze. The study was conducted in 2009, but people are still citing it. In the six years since this study was released, there have been many, many similar studies. Diethylene glycol has never been detected again. Since it was only found in one sample (at a low concentration) it can hardly be treated as a common problem in e-liquid. It’s also an ingredient added to cigarettes. Finally, even if the levels found by the FDA were present in every e-cigarette, it probably still wouldn’t be a major health concern. This study recruited over 1,000 cancer patients who were also smokers. They were all asked if they’d used e-cigs, and were grouped accordingly. The researchers followed up with them all six months later to see who’d quit. The e-cigarette users were just as likely as non-users to be abstinent from smoking after six months. They were even less likely depending on how the data was analysed. Like the quitline callers study, this study classed anybody who’d vaped in the month before the start of the study as an “e-cigarette user.” However, only those who continued to smoke were eligible to participate. Michael Siegel poses the following situation to show the problem. 1000 vapers enter the cancer centre, but 900 have already quit smoking successfully. The 100 who didn’t quit would be the ones in this study. If you focus on the treatment failures and ignore the successes, you can make any treatment look bad. Look specifically at 1000 people with headaches that don’t respond to paracetamol or cancer that doesn’t respond to chemo and you could make them look ineffective too. This study looked at the relationship between trying vaping and intentions to smoke. The data was taken from the 2011 to 2013 US National Youth Tobacco Surveys. Basically, it’s a proxy to a “gateway” finding. If never-smoking teens who vape are more interested in smoking, it could mean that vaping caused the increased desire to smoke. Intentions to smoke were higher in teens who’d ever used e-cigarettes or who’d vaped in the past 30 days. Imagine a teen who said he definitely wouldn’t smoke in the next year, but just said he’d “probably not” smoke if offered a cigarette by a close friend. After all, peer pressure could affect him. He would be seen as having “intentions” to smoke in this study. This study aimed to determine whether vaping was linked to successful quitting. It used a group of 949 smokers who completed surveys in 2011 and 2012. The “e-cigarette users” were separated from the non-users, and their intentions to quit were also measured. This is just like the other studies finding no benefit of e-cigs for quitting. The problem is it recruited smokers and only asked about e-cigarette use at the start of the study. This means it only sampled smokers who had already struggled to quit by vaping. Worse than that, 60 % of the e-cig users in the study had no intention of quitting smoking in the next six months at the start of the study. So the researchers had a small group of people who’d tried e-cigarettes but hadn’t quit smoking, with little intention of quitting and who may or may not have used e-cigs to try to quit in the studied time period. Yeah, it’s hardly convincing evidence. This study set out to work out what effect trying vaping had on 16 to 26 year-old non-smokers who weren’t susceptible to smoking. They asked about vaping at the start of the study, and then followed up a year later to see if participants had smoked or become susceptible. Almost 700 participants were included in the study. Of the 16 participants who had vaped at the start of the study, 11 of them progressed “towards” cigarette smoking a year later. Six actually smoked and the remaining five just became susceptible. This was a larger percentage than those who didn’t try vaping. Although this study determined whether the vaping or smoking came first, there’s still a familiar problem. Both vaping and smoking were defined as any use, even just a puff. Taking a puff of an e-cig then later taking a puff of a cigarette is not a “gateway effect” in the way anybody understands it. The tiny sample of 16 for the “e-cig user” group just heaps problems onto the already flawed study, and only six of them went onto smoke. Dr. Michael Siegel: Does new JAMA Pediatrics study show that e-cigarettes are a gateway to youth smoking? This study looked at whether trying vaping affects your ability to quit smoking within the following year. The researchers split up 1000 smokers based on their vaping history, and then followed up with them a year later. 3. Anyone who originally said they’d never vape, but had tried it or decided they might try it at the time of follow-up. So it didn’t really compare e-cig users to non users. It compared smokers who’d used e-cigs at the start of the study (but hadn’t quit) with those who consistently said that they’d never use e-cigs. Michael Siegel explains the many ways in which this could lead to bias. The main one is that people who say they’ll never vape are probably confident in their ability to quit, and more likely to be successful. Also, like previous “e-cigs don’t help you quit” studies, this looked at people who’d vaped at least once in the past, not smokers actually trying to quit by vaping. This is a systematic review of the evidence on e-cigarettes. It covers both safety issues and the benefits of e-cigarettes for smokers trying to quit. The authors conclude that e-cigarettes are not proven to help smokers quit, that e-cigs are a source of “indoor air pollution” and that they threaten to renormalize smoking. It does acknowledge that e-cigs are safer than cigarettes, though. This review is what happens when you collect all these low-quality studies into one paper, mention the better-quality ones (but ultimately ignore them), and then make a raft of recommendations to doctors and policy makers. For example, the authors conclude that e-cigs don’t help smokers quit, and cite five studies to support that conclusion. Guess which studies they are? The ones covered in this article and similar studies. You know, the ones that don’t even ask if participants are trying to quit smoking by vaping and specifically only include smokers who’ve already tried vaping but haven’t successfully quit. The authors of this study examined the effect of e-liquids which contained alcohol (23.5% or 0.4%) on motor impairment. The authors concluded that e-cigarettes that contained high levels of alcohol could impair motor impairment. They also suggested these could increase the risk of car crashes and increase the risk of addiction to both alcohol and nicotine. Despite the conclusions, the scientists were able to find no detectable level of alcohol in the blood of vapers. What’s more, no motor impairment was found amongst vapers who used higher alcohol e-liquid. In fact, the performance of vapers actually improved from baseline. The reason given for reduced motor impairment was that vapers using lower alcohol e-juice performed better than vapers using higher alcohol e-liquid. The people citing these studies have one thing in common. They’re concerned about the potential risks of e-cigarettes. They worry that non-smokers and children might start vaping under the impression that they’re safe. They worry that e-cigs aren’t as safe as they seem. It’s completely understandable, and we do need to look into these possibilities. The big issue is that the messages don’t only go out to non-smokers, they reach smokers too. Those smokers, possibly considering switching to vaping, have a confusing, tangled web of contradicting opinions to navigate. Citing such obviously flawed studies to cast doubt on the benefits of e-cigarettes just makes this process harder. It’s no wonder smokers (and the public) are increasingly getting the wrong idea about e-cigarettes. Without having the time to dig behind the headlines, you’d definitely think that vaping wasn’t a good idea. You might even hear all this and think “I might as well smoke,” much like the son of the woman who emailed Dr. Farsalinos. That’s why opponents of vaping should stop citing studies like this. For every citation given to a piece of fear-promoting junk science, the risk that a smoker will say “I might as well smoke” or worse “I’ll just go back to smoking” increases. For anyone purporting to care about people’s health, that should be utterly unacceptable. I think this is an important post. If you do too, I’d really appreciate it if you’d share it. You’ll see I came to basically the same conclusion, but went into the details of the craziness involved. I’ve examined others of the 18 examples here in similar depth, both in TN and on various boards, and they area almost all just as bad. These are pieces of research that have conclusions bought and paid for, just as assuredly as any “Tobacco Company Scientists” found cigarettes themselves to be full of rainbows and happily purring unicorns. Read the research and read the critical analyses of the research and you’ll have a solid seat for defending discriminations based upon either secondhand vaping or secondhand smoking. The same people out there that attacked smokers are now using the same methods to attack vaping. Learn the tricks that they use and what to watch out for and you’ll be able to defend yourselves. Wonderful analysis here! Keep on fightin’! Thanks very much Michael! Great job on the analysis of the FDA study – particularly the point about them not even picking up another sample of the juice to see if it was just a one-off. It wouldn’t have been difficult, but since they’d gotten the sort of result they were looking for they obviously didn’t care enough to find out. Definitely agree about learning the tricks too – you start to see the same flaws over and over again when you look at one or two of the studies a little deeper. You keep on fighting too! Well done! A terrific reference point for responses to articles and for letter writing..
And thanks for the additional info MJM. Thank you, hopefully it will give vapers some ammo in the ongoing debate! Probably a touch out of my depth with that one to be honest – I’d love to see what some of the researchers had to say about it, but can’t seem to find any comments from them. Although it’s interesting that they compared e-cigs to cigarettes and none of that made it into the abstract – they just focus on the effect of vaping without the context relevant to most users. In fact, figures 2, 4, 5 and 6 (i.e. the ones with comparisons) from the full text look like cigarettes have a much greater effect than e-cigs. All of these chemicals are present in e-cigs, but at much higher levels in cigarettes, so it would make sense that e-cigs would have a smaller effect in comparison. So the study looks like it shows e-cigarettes aren’t completely safe (which we know they aren’t anyway), but appears as though they are much safer than cigarettes, based on this study and (more importantly) all of the other evidence available. Honestly, though, as I said, I’m not really qualified to investigate the details myself – I’d assume all the methods e.t.c. are sound without good reason to say otherwise. Thank you for this information about e cigarettes/vaping. Certainly an eye opener for those who doesn’t really know how less harmful are these than puffing a real cigarette. I think these studies are made so that people take vaping negatively. If I were to choose between vaping and smoking, I’d still choose vaping since it is less harmful than the latter. I think these studies are made so that people take vaping negatively. Yep, spot on I am afraid! You’ve done a great job, Lee! This article not only summarizes the flaws of many heavily promoted studies but also showcases the methods used for forming the baseline of anti-vaping propaganda. I’m glad James Dunworth sent me the link and I AM going to share it! In my mind some of the most hair raising studies were the two which focused on formaldehyde emission of e cigarettes. They were carried out with study setups that no normal vaper in realty would replicate. Bottom line is they kept drawing dry hits by using a very high ecig voltage in the test device. The taste of a dry hit to every human being is disgusting and no one in their right mind would vape with such settings in reality! I seriously do hope the legislation which has been published by the FDA and some of the more restrictive European implementations of TPD2 get challenged in court by the big industry players who can afford it asap! I’m pretty sure there will be these court cases, even from the one or other big tobacco player. Besides, I sincerely thank Dr. Konstantinos for his fantastic and scientifically sound approach to lead the debate into a positive direction. Thank you for your great article. What i´m expieriencing everyday is that most of the people in my country (germany) still think that electronic cigarettes are more harmful than traditional “real” cigarettes. It´s a great example how great disinformation works. It´s sad that it will be good for all e-smokers that the big tobacco companies are trying to get a foot in the e-smokers industry. 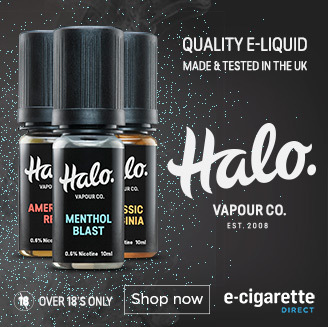 GIVEAWAY: Win A Halo Xmas Vaping Hamper (£400 Value) Enter in seconds!